You! My friend. Have got that something special. Can we just pause for a second to please remember that? The passion you possess for seeing others rise and overcome. The vision that you have for helping people grow and shift. And a true, TRUE desire to help people. I am guessing that you already know in your heart that helping, coaching, healing: it’s what you’re meant to do and who you’re meant to be. Likely, because you’ve been doing it for as long as you remember! It probably feels super natural because it’s just this innate part of you. That said, I know that there’s this challenge that so many of us inspired, heart-centered women (and men) face all the time. I know it, because I faced it too. The extreme desire to coach…but no clients to coach! Or maybe discouragement about how to even go about finding the right clients consistently. Trust a sista You are SO not alone in this. It’s something every single service-provider at one point or another has faced. 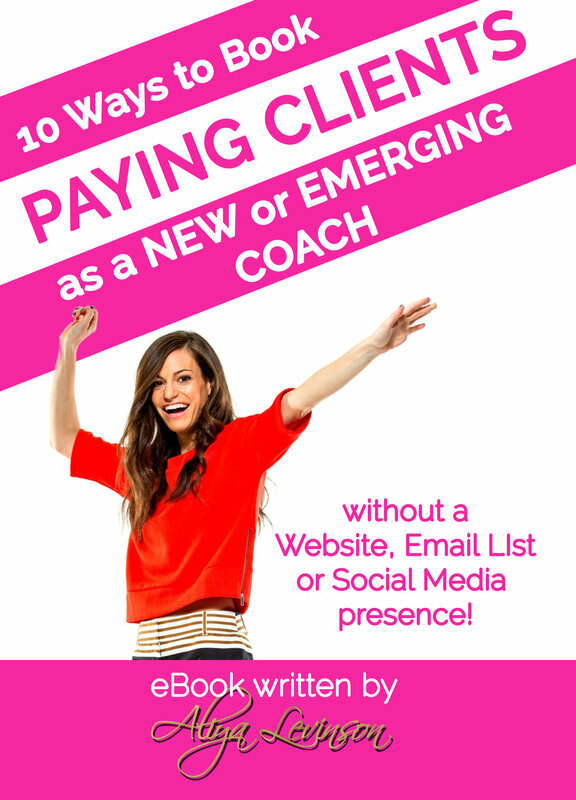 Especially those of us who just want to coach, and the whole “finding clients” thing seems like a struggle –like…ahem, did I sign up for this? And, as someone who similarly has a real intention to genuinely help people, I know how much this problem elicits extreme stress and anxiety. Maybe you’re wondering how to get in front of the right people consistently. When you can let go of that fear of being perfect and needing to have all the answers, or be a total expert, or have every single duck in a row and can simply be yourself around people, that’s when your perfect ideal clients will suddenly seem to appear out of nowhere. And perhaps you wonder what will happen when you do meet these people. How do you share what you know or how you can actually help them? If you come from a place of truth -- if you come from your heart -- then that authenticity will shine through. I’ve seen it again and again for myself and my clients. There’s no doubt that you have the capacity to make an important difference in people’s lives. You have value -- and your people –the ones who are meant to work with, transform, learn, and be coached by you – they will recognize it. So, where do you begin with this process and with generating leads? Those friends, family members, and acquaintances who know you -- personally and/or professionally. Because they already know your value and recognize the impact you have. When you come from your heart and a place of honesty and trust about what you’re creating and who you want to connect with…they’re going to be excited to help ya out and pass along your message! By taking part in this process, you’ll create leads from the recommendations and referrals of people who know you best. Plus, with this as a starting point, it alleviates some of that stress and anxiety because you completely bypass that awkwardness and worry that you won’t present yourself in the way you truly want to. So! Here’s the deal, yo! Generating leads, connecting with your ideal clients -- it does not have to be anxiety ridden. It can actually feel comfortable and encouraging -- not only for you but for those referred to you by people they also trust! Beyond that, we all know that networking is so often the key to finding new opportunities. So get on those social media platforms that you already know and regularly use to tell people about your venture. Let them what it is you’re up to. Who it is you’re looking to connect with. Offer your help to others. Share your amazing value that you have simply by being YOU! This helps spread your message, and get the word out. Also, create a LinkedIn profile to share your professional story and to create a name for yourself in the online entrepreneurial networking world. And, when you’ve generated leads, offer a 15 to 20 minute free consultation. Before the consultation, ask the lead some questions to get an idea about why they are seeking your help. Use the information to provide authentic, genuine feedback. With this process, your leads will see the value you’ll add to their life and/or business. If you’re feeling overwhelmed with the prospect of generating leads, let’s chat. It doesn’t have to be difficult and you do not need to go it alone. Book a call with me here. P.S. -- Want more ideas about how to generate leads? I have 10 (plus a bonus 10) for you=) Don’t miss this!